This huge swath of sky was imaged by Tracy Tuttle (Kansas State University) with a Tele Vue 102 Apo, and an ST-8300 through LRGB filters. The Trifid nebula is called that because of the three distinct sections in the central core of the emission nebula. That part can be seen with the naked eye. 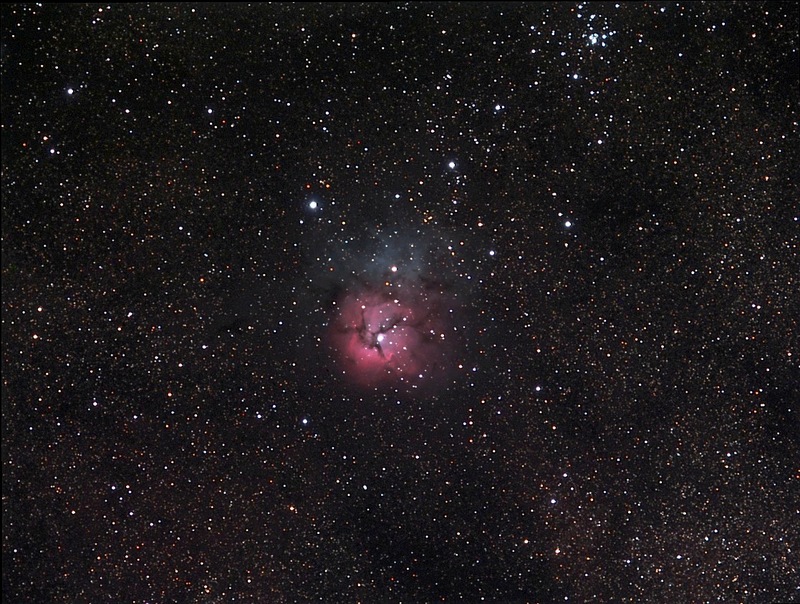 What cannot be seen with the naked eye is the Trifid's wonderful detail of both emission and reflection nebulae. The red glow of ionized Hydrogen is the very distinctive emission. The blue is reflected light from the 7.31 magnitude, B9IV type star, SAO 186149, roughly centered in the refection portion. The open cluster M21 is above and to the right in this incredible star field. NCKAS Messier Marathon - Collaborative Messier Marathon with NCKAS, New Mexico Tech - Estcom Observatory, Outhouse Observatory, SETEC Observatory and Birdhouse Observatory..
NCKAS Scheduled Viewing Events - NCKAS latest updates on viewing sessions. NCKAS Projects - This link highlights our current NCKAS Project List. NCKAS Image site - Members imaging and capturing data of special events. This page will hold all our processed images and data. The images on this page can be quite large. NCKAS Weather Page - Current Weather and Sky information for viewing. NCKAS Viewing Locations and Equipment - Listing of our current viewing locations and equipment in use. Boy Scouts of America: Astronomy Merit Badge Program - Our Boy Scouts Merit Badge Program information. NCKAS Legal - NCKAS Constitution and Bylaws. Photopic Sky Survey - One of the most incredible sites on the Internet! The Photopic Sky Survey is a 5,000 megapixel photograph of the entire night sky stitched together from 37,440 exposures. American Association of Variable Star Observers (AAVSO) - The best resource on variable stars. Clear Sky Clock to help determine if the conditions will be favorable for the area. New Mexico Skies - An incredible dark sky guest observatory in southern New Mexico. Skyhound.com - A site by Greg Crinklaw, the author of PC-Sky and SkyTools, is an accomplished astronomer, educator, and programmer. Light Pollution guide for the North Central Kansas Region and Kansas. Hawaiian Starlight aims at showing to the public astronomical images obtained with the Canada-France-Hawaii Telescope (CFHT). Super Image Map of all 110 Messier Objects from The Arcturus Observatory web site by Cometman. Listing and links of all 110 Messier Objects from APOD (Astonomy Picture of the Day). The Astronomy Picture of the Day (APOD). Our local Community Network ISP NCKCN. Astronomy Clubs - A resource of Astronomy Clubs World-wide. Astronomy for Kids - Astonomy for children, students, and kids of all ages. KidsAstronomy.com, part of the KidsKnowIt Network, is the absolutely free astronomy resource designed to teach children about the exciting world of outer space. New Scientist - Great site for science news. *Unless otherwise noted all images are from the STScI Digitized Sky Survey.